Who Has The Best Burgers At Sea? Cruise vacations involve eating multi-course meals in fancy dining rooms and making choices from lavish buffet spreads, which is part of the fun. But at some point you may find yourself craving a simple burger. Cruise ships have you covered there too. Check out the best burgers at sea on these cruise lines. 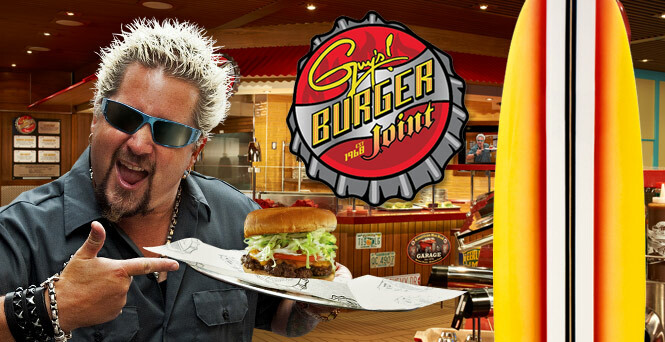 Carnival: Food Network star Guy Fieri delivers thousands of fat, greasy and delicious burgers at his poolside, California surfer-themed Guy’s Burger Joint on several Carnival ships. The meat is 80/20 ground-chuck and you can have your complimentary burger topped with lots of cheese and Donkey Sauce (a secret mayo combo). 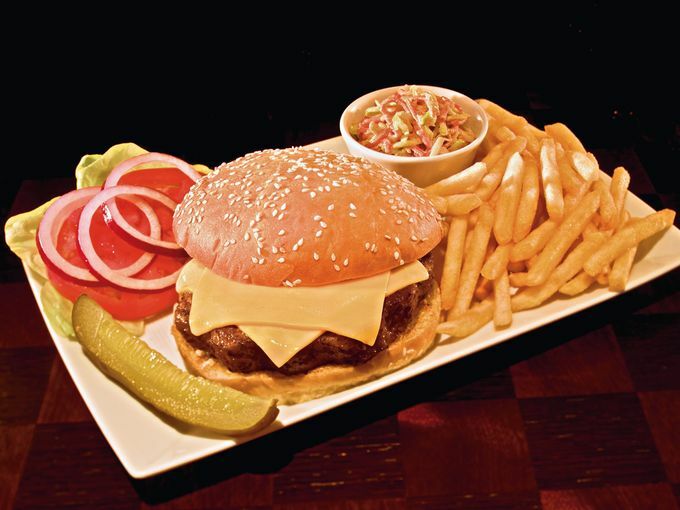 Silversea: You can get a burger day or night, either at The Pool Grill, in The Restaurant at lunch or via 24-hour room service, and it’s a yummy one. The chefs use USDA Top Sirloin to make the patties. Seabourn: At the outdoor grill or via room service you can order a juicy, American-style hamburger or cheeseburger, made of high quality meat and served with fries. It’s a classic. 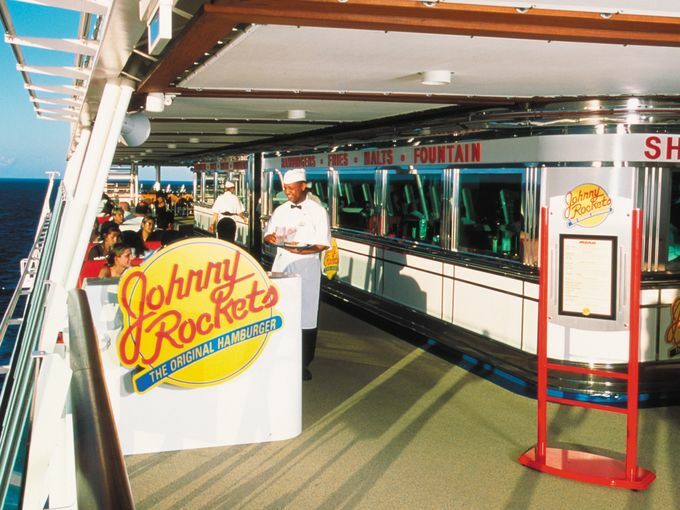 Royal Caribbean:Just as on land, Johnny Rockets outlets on a dozen Royal Caribbean ships serve up burgers such as The Original, 1/3rd pound of all-natural beef on a bun, topped with shredded lettuce, tomato, chopped onions, relish, pickle, mustard and mayo. Accompany your burger with a shake, chili fries and apple pie. Cover charge $4.95. Oceania Cruises: The best gourmet burgers at sea feature Black Angus Beef and are served at the Waves Grill onboard this upscale line’s five ships. Go classic or get one topped with Swiss cheese. There’s also a menu of crazy combos such as The Kobe Burger, made with Wagyu beef, topped with black truffle sauce and baby crass. It’s decadent and delicious. Celebrity Cruises:Celebrity is in the process of redoing its Lido buffet areas into marketplace-like spaces where dishes are creatively packaged. This continues at the poolside grill, where you can get a tasty burger, wrapped in paper (like at a fast food joint) and crispy fries served in a miniature, paper-lined fry basket. Holland America Line: While you can indulge in a filet mignon burger at the fancy, for-a-fee Pinnacle Grill, you can also dig into perfectly wonderful, complimentary burgers at Dive-In at the Terrace Grill. The poolside grills have signature burgers that are hand-formed, served on a toasted brioche bun and feature a “secret” sauce. The Gainer comes with a mound of crispy frizzled onions; The Cannonball with Gouda cheese, applewood smoked bacon and sweet caramelized onions. If you want a simple cheeseburger ask for The High-Dive. Norwegian Cruise Line: There are grills where you can get a patty on a bun, but the best burgers are at Cagney’s Steakhouse, where the menu includes Wagyu Beef Sliders. They’re on a bun, topped with caramelized red onions and come with apple & celery slaw. Have a second course of a Certified Angus Beef filet mignon, and don’t miss the truffle fries. Cover charge: $30 adults, $15 kids. Crystal Cruises: The all-beef burgers are classic and the accompanying sweet potato fries put them over the top at the grills on Crystal Symphony and Crystal Serenity. SeaDream Yacht Club: The chefs on the line’s two small ships want you to feel at home (if home is a sophisticated yacht). Order a beef burger, or if you prefer, see if they have any other choices such as buffalo or ostrich. You can have your burger delivered anywhere on the ship including to the hot tub or your lounge chair. The accompanying homemade onion rings are divine. Like big ships that are chock full of activities? 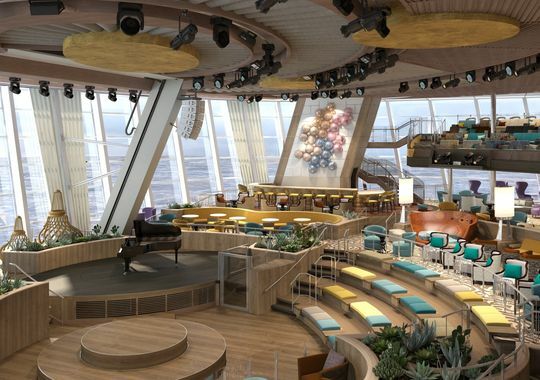 You’ll love Quantum of the Seas, the new floating mega-resort from Royal Caribbean. 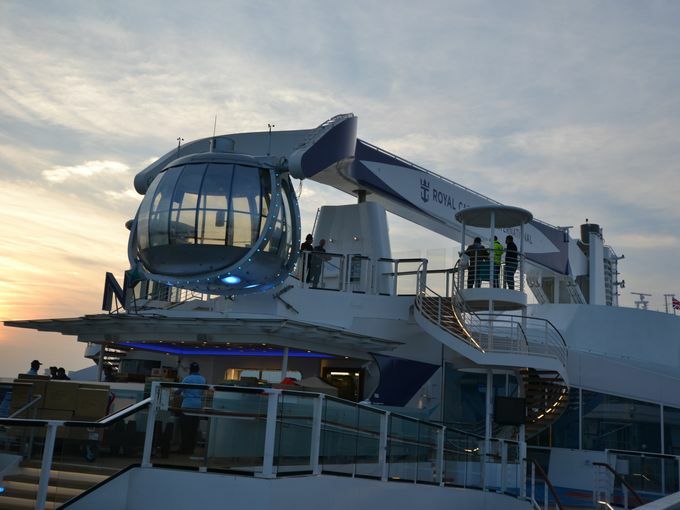 Packed full of gee-whiz attractions such as a giant mechanical arm that takes passengers into the sky for bird’s eye views, it’s a big, bold vessel that breaks new ground on several levels. 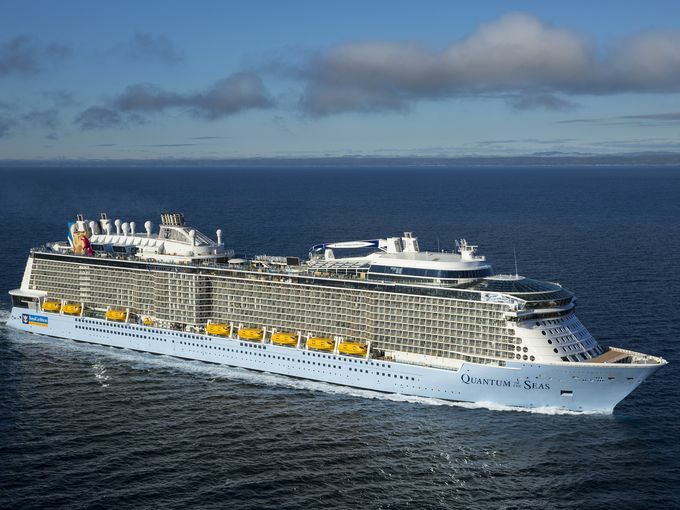 With 16 public decks and room for nearly 5,000 passengers, the third largest cruise ship ever built boasts an array of lounges, bars and restaurants to rival the biggest resorts of Las Vegas and Orlando; first-ever-at-sea options such as a skydiving simulator; and innovative technology that makes checking in, reserving shows or even surfing the Internet a breeze. 1. Two70. Prepare to be dazzled in this two-deck-high, multi-purpose entertainment and lounge space at the back of the ship. Featuring wraparound, floor-to-ceiling windows that offer stunning, 270-degree views (hence the name Two70), cozy seating areas and an adjacent cafe, it serves as giant family room during the day. But it is at night when it really shines, transforming into a high-tech showroom. The panoramic windows morph into a giant wraparound screen that is filled with visual delights, while periodic performances bring aerialists who descend from the ceiling, images projected on moving robotic screens and more. 2. SeaPlex. 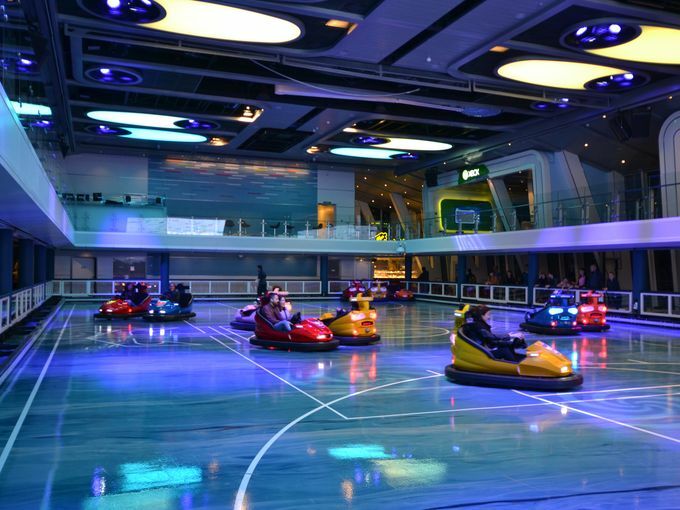 This giant, multi-use activity area at the top of the vessel offers everything from bumper cars and roller skating (both cruise ship firsts) to basketball and even trapeze lessons. Two levels high, it also has upstairs nooks for playing Xbox, ping pong and foosball. And the space also has what’s billed as the first food truck at sea, an outlet called the SeaPlex Dog House that serves up hot dogs, bratwurst and sausages. 3. New flexible dining. The days of being herded into a cavernous dining room for a banquet-style dinner (often at a giant table with strangers) are coming to an end at Royal Caribbean — and none too soon. On Quantum, the traditional main dining room has been replaced by four smaller, no-extra-charge restaurants that passengers can visit when and with whom they choose. Each offers a different cuisine, from contemporary American to pan-Asian. 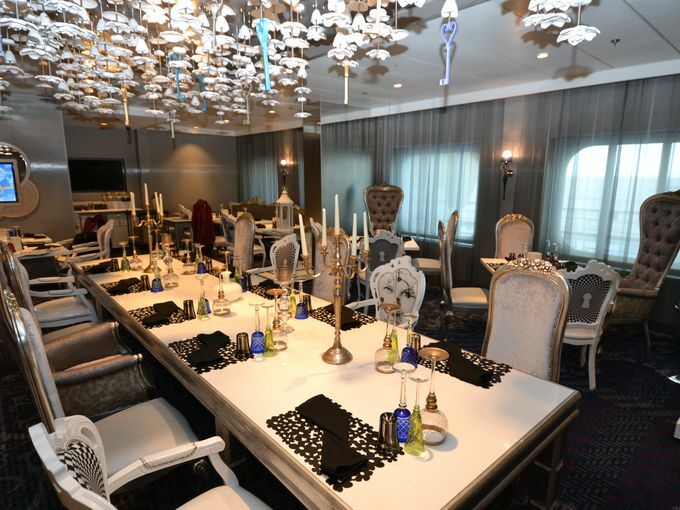 A fifth no-extra-charge restaurant is reserved for passengers in suites, and there’s also a wide array of extra-charge eateries on board from a steakhouse to a sushi outlet. 4. Huge Suites. 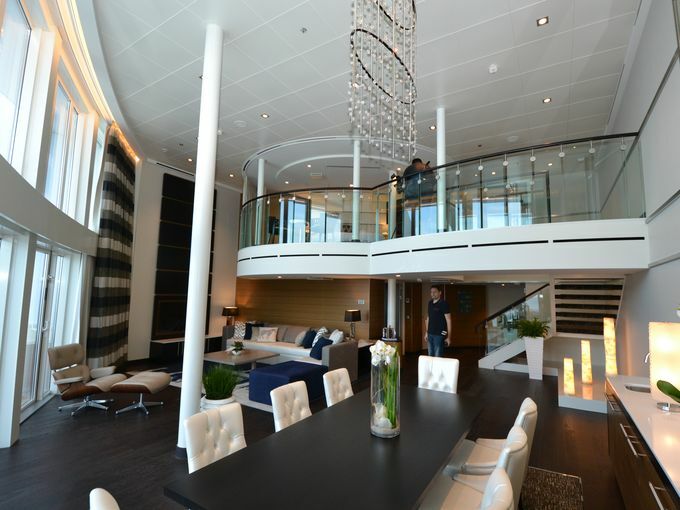 Royal Caribbean’s newest ship, Quantum of the Seas, features some of the most elaborate suites at sea, including the two-deck-high, 1,640-square-foot Royal Loft Suite. Sleeping up to six, the Royal Loft Suite offers a panoramic view over the back of the ship from a two-deck-high living and dining room level. The space has a dry bar and sofa that converts into a double bed. 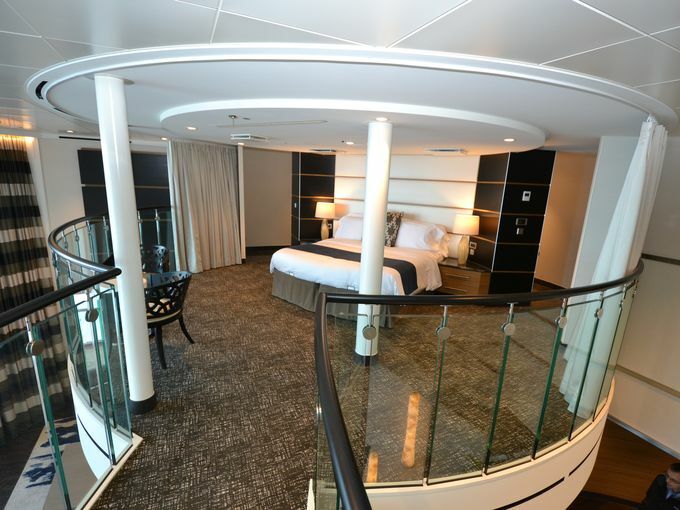 The Royal Loft Suite has an expansive, 415-square-foot private balcony with a private whirlpool that overlook the back of the ship. The main bedroom of the Royal Loft Suite, on the second floor, overlooks the main floor. 5. North Star. Perhaps the most notable new feature of Quantum of the Seas is North Star — a giant mechanical arm that takes passengers soaring above the vessel in a glass-enclosed capsule. A first for a cruise ship, the North Star can hold up to 14 people, including an operator. When fully extended, the North Star soars 303 feet above sea level. Passengers can see the entire length of the ship from the North Star capsule when it is fully extended.